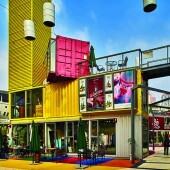 To build an“art market”in fast pace and express the casual nature of the program,recycled containers are used as architectural canvases for creative expression. Exterior skin of the recycled containers are painted and polished by the tenants and public, they are welcome to draw on the containers. Din Din the yellow cat is the icon of the center, they appear without any facial features, children are invited to draw the features to give them different faces everyday. The centre is all about public participation. 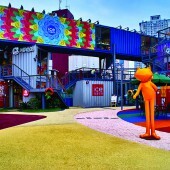 A system of organic open spaces was meticulously crafted by fast erection of 27 recycled containers, to produce a seemingly casual nomadic market. 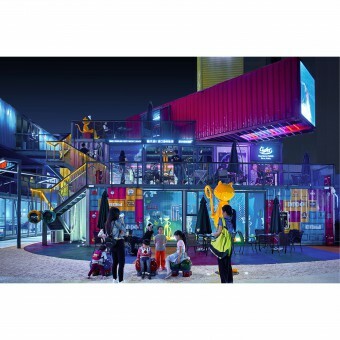 Like building a nomadic village, the containers are causally positioned and stacked in three-storey, spaces inside the containers are partitioned into rooms for various workshops and sales points for pop art and designer items, light food and beverage. (1) Interactive Circulation Path:Terraces are from after the stacking of containers. External steel staircases are used to connect different floors. An unconventional circulation pattern ensures that visitors are guided not only along corridors but leaded inside container rooms throughout different floors, this pattern escapes from explicit planning logic of typical corridor in front of a room, and fuses the realms of private and public and encourages intimate encounters between visitors and designers. (2) public participation: The exterior skin of the containers are painted and polished by the public and shop owners, they are welcome to draw on the containers to express idea. Din Din the yellow cat is the icon of the centre, they appear without any face features, and children are invited to draw the eyes and mouths on their face to express their mood. It is all about participation. Design started in June 2015 and construction finished in September 2015, intended to run for two year. (1) The supporting system to stack the containers is corner steel posts and horizontal spacers, maximum structural span ensured. As a result, all structural components are very slim. When two containers are stacked up, the floor depth in between is just about 400mm, appeared as thin floor “separation”. Taking advantage of the slim quality of the elements and thin container floor slab, indoor activates at all levels are highly visible to the outdoor. The short visual distances between the container workshops make the activities at multi levels more transparent to the outside, and purposefully established a cozy and familiar environment, and encourage more human interactions. (2) Recycle material: Not only are the containers acquired from recycled site, the entire project is reusable. Standard size building materials e.g. steel staircases, balustrades, ground paving gravels are reused, recycled oil cans are used as outdoor luminaries and planter boxed. The act allows the client to move the containers and other building materials to another site later. (1) Floating tectonic system: since only 2 months were allow for construction, apart from choosing container as building major material, the project transformed the perception of conventional regularity and vertical stacking of containers to floating tectonic system with enhanced transparency for interactions. Old containers in standard size 6m and 12m are used. Some rooms are combined by 2 or 3 containers in order to make wider space, some rooms only in a single narrow container, particularly those on higher floors. Placed and stacked in all directions, 2 large open space/squares are formed near the clusters. (2) Customization: Rooms on upper levels are standalone container of 2.5m wide, with a full-height window, the massing of these containers are greatly reduced. It gives high transparency to indoor and outdoor connection. Atelier Global Limited , 2016. Design Firm: Atelier Global Limited; Client: CHANGSHA SHENGBANG REAL ESTATE DEVELOPMENT COMPANY. Atelier Global is a young and aspiring practice that has strong belief in the power of design and creativity. We regard architectural design as quintessential to living environments that constantly encounters new and emerging needs. Hence we are not bounded by a conventional modernism approach with a singularity concern on differentiation of space and function. Rather, we always search for possibilities that may not be easily foreseen, and create projects with new insights by establishing various seemingly unrelated cross links to different project types, scales and spaces. Our systematic yet trans-boundary approach on design has been successfully applied to comprehensive project types including culture, education, hospitality, living communities, retail and working spaces. All of our projects are executed with critical attention to details and our completed projects have received renowned recognition from the professional industry. Atelier Global has received numerous design awards from Hong Kong and Cross-strait professional institutions and is actively involved in academic and cultural research including design Biennales and university teaching. Changsha Din Din Creativity Centre Architecture-commercial/Community by Atelier Global Limited is a Nominee in Architecture, Building and Structure Design Category. · Click here to register today inorder to be able to view the profile and other works by Atelier Global Limited when results are announced. Changsha Din Din Creativity Centre Architecture-commercial/Community by Atelier Global Limited is Winner in Architecture, Building and Structure Design Category, 2016 - 2017. · Press Members: Login or Register to request an exclusive interview with Atelier Global Limited . · Click here to register inorder to view the profile and other works by Atelier Global Limited . 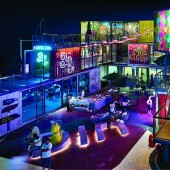 Did you like Atelier Global Limited's Architecture Design? 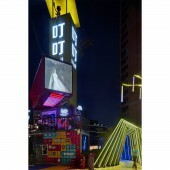 Did you like Changsha Din Din Creativity Centre Architecture-commercial/Community? Help us create a global awareness for good architecture design worldwide. Show your support for Atelier Global Limited, the creator of great architecture design by gifting them a nomination ticket so that we could promote more of their great architecture designs.